It was big news when the Supreme Court decided last week that police could not search the contents of a suspect’s phone without a warrant. But how will this decision impact other privacy challenges we have been facing? The ruling didn’t directly apply to bulk cell phone data gathering, but it did broadly reference the privacy protections that are due to the kinds of sweeping data available on today’s mobile devices, USA Today reported. “The court’s reasoning clearly recognizes that the aggregation of sensitive electronic data raises particularly acute Fourth Amendment concerns that call for more robust judicial protections of our privacy,” said Nathan Wessler, an attorney with the Speech, Privacy and Technology Project for the American Civil Liberties Union, who has been fighting for the release of records about data collection across the U.S. “While the Supreme Court has not yet settled the issue in other contexts, lower courts can learn much from this decision about how to safeguard our privacy rights in the digital age.” (Source: USA Today) This ruling has set precedent for cases against law enforcement using technology to access data from cell phone towers. There have been many court cases questioning the legality of this technology, but no official stance has been taken. 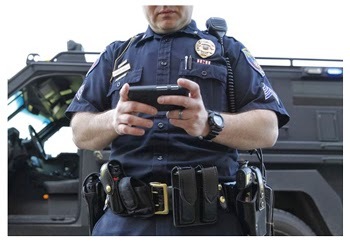 USA Today reported that since December, nine states have adopted laws requiring police to obtain search warrants to gather cell phone data. Two other states already had laws on the books and at least 10 more legislatures are weighing similar measures. Subscribe to our daily eNewsletter! Sign up for our daily eNewsletter here. 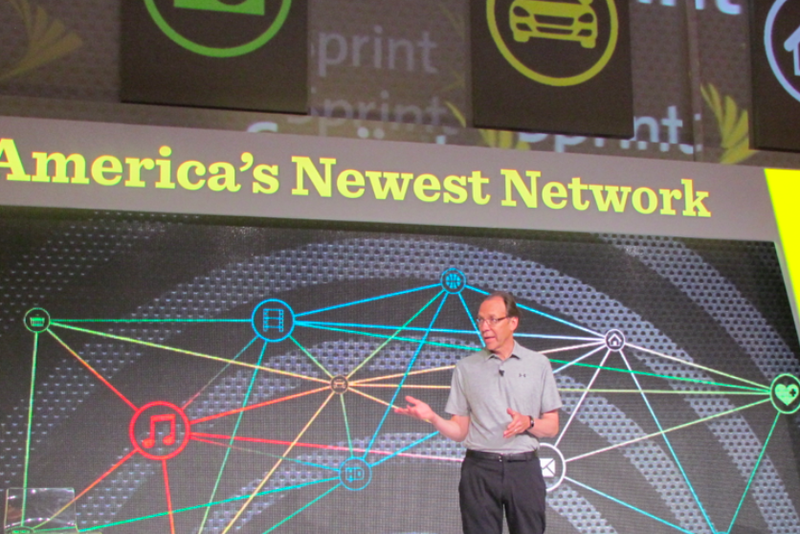 On June 23rd, Sprint (S) held their Happy Connecting event in Chicago and although there was no jaw-dropping news, the company hosted a tower of a Sprint Spark cell site with Dr. John Saw, Chief Network Officer. “While we believe the announcements were received more as “ho-hum,” our cell site tour offered us more evidence that Sprint is indeed taking strides in the right direction with its network re-build,” Jennifer Fritzsche, Senior Analyst at Wells Fargo said. The tour was of a tri-band test site, where Sprint leverages its 8T8R technology on 2.5GHz, 1.9GHz (4T2R) and 800MHz (1T2R) radios. “Saw mentioned the technology also allows for multi-antenna processing (multi-mode MIMO). He mentioned 8×8 MIMO can achieve 4x speeds, and produce theoretical download speeds +1Gbps. With 3 carriers lit (60MHz total), theoretical speeds increase to +150Mbps. A software upgrade is required to light up each additional carrier. These cell sites improve urban coverage 20-25% (and help in-building coverage), suburban coverage by 50% and rural areas by 70%. S has deployed “hundreds” of these sites around the country thus far,” Fritzsche explained. The FCC isn’t playing around and has issued two Notices of Apparent Liability for Forfeiture and Order regarding tower owners failing to keep their structures properly lit. 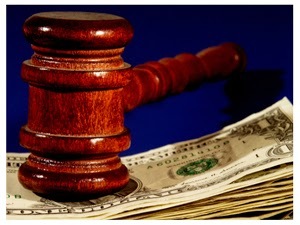 On June 10th, the FCC proposed a fine of $15,000 against Northeast Passage Corporation, the owner of an antenna structure in Highstown, New Jersey, for violating the rules concerning antenna lighting. According to the NAL, “Agents from the Enforcement Bureau’s Philadelphia Office found that NE Passage was neither properly monitoring nor maintaining the daytime lights on its antenna structure. NE Passage also failed to notify the Commission of an increase in the antenna structure’s height. NE Passage’s disregard for the rules posed a potential safety hazard to air traffic and warrants an increased penalty.” More recently, on June 19th, the FCC proposed a penalty of $10,000 against Duhamel Broadcasting Enterprises for the same reason. According to the NAL, “Although Duhamel believed that the structure did not require lighting because of its position in a three-tower array, the Federal Aviation Administration (FAA) notified Duhamel officially that lighting was required for the antenna structure. Given that public safety is at risk when antenna structures are not properly illuminated, Duhamel’s failure to light the structure after the FAA notification warrants a significant penalty.” Make sure to keep your towers lit! If you supply tower lighting products and wish to be a part of Inside Tower’s July Product Showcase featuring Tower Lighting, then please contact Phil. Is there a better way to test your mobile network than to give out free iPhones for seven days with no strings attached? I don’t think so. At T-Mobile’s Uncarrier 5.0 event Wednesday night, CEO John Legere shared a new concept in the mobile industry: the test phone. Starting Monday, T-Mobile will send any potential customer an iPhone 5s and let him or her have free reign over its network for seven days. T-Mobile has been making a lot of network upgrades and on Wednesday, T-Mobile CTO Neville Ray revealed the carrier has piled a lot more spectrum onto its LTE network, increasing capacity and data speeds by 50 percent in 16 cities. It will be interesting to see how consumers respond to this test and how T-Mobile’s network handles the traffic. 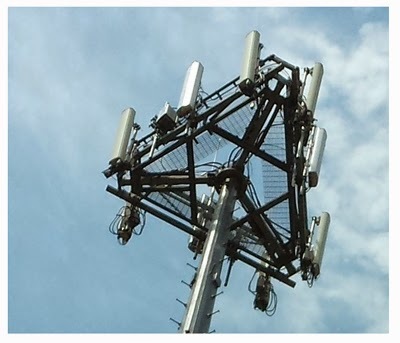 Tuesday, June 17th a 28-year old man fell from a cell phone tower in San Angelo, Texas. During the investigation, detectives determined that the man fell as a result of an issue with his safety equipment. 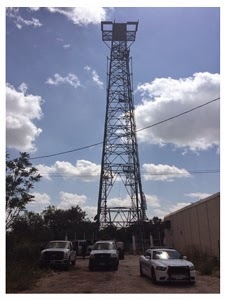 “What they found was that when he was working on the tower making some adjustments to his safety equipment there was some type of issue…and at that point he fell,” SAPD Public Information Officer Tracy Gonzalez said. The man worked for MTSI, a full wireless network deployment and maintenance company, which is based in Richardson, TX. The man was working on a tower of 140-feet, and is a fixture in the downtown area and was originally built to mount multiple large two-ton feed horns that were part of the old AT&T long distance TDM network called “1 plus.” Since AT&T deactivated the old “1 plus” network years ago, these towers have been sold off to various property owners and investors. Charlie Guyer, VP Communications for Goodman Networks, AT&T’s contractor for tower construction and maintenance issued a statement. 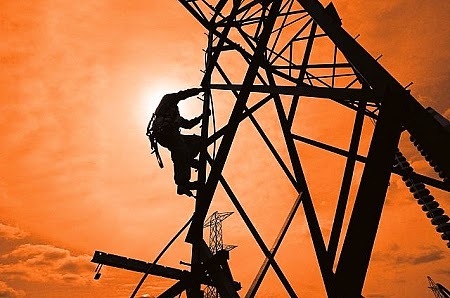 “The company has just been informed of a fatality involving one of our subcontractors Microwave Transmission Systems (MTSI). We extend our deepest condolences to the family. We are conducting an investigation and are fully cooperating with local, state and federal authorities,” he said. Guyer said that his company routinely subcontracts with other companies to handle tower work all over the country. Sprint has been pretty busy lately. Between the talks about buying T-Mobile and now partnering with 12 regional carriers, they’re definitely trying to claw their way out last place among the big 4 carriers. The newly expanded roaming network covers 34 million people across 23 states and some 352,000 square miles. Divided among the dozen carriers, Sprint’s main focus is to create more wireless choice and competition across rural American markets. The mostly rural carriers include: SouthernLINC Wireless, C Spire Wireless, nTelos, Nex-Tech Wireless, Flat Wireless, SI Wireless, Inland Cellular, Illinois Valley Cellular, Carolina West Wireless, James Valley Telecommunications, VTel Wireless, and Phoenix Wireless. According to Sprint, customers will be able to roam on the 4G LTE networks of the new partners and vice versa. Sprint is also working with the 12 carriers in the hopes they will participate in their “device and infrastructure ecosystem,” aimed at helping to lower local network costs while also providing access to a more diverse device portfolio. “These agreements demonstrate Sprint’s commitment to provide better coverage, a faster network and a wider selection of lower-cost wireless devices to all customers, regardless of where they live,” said Michael C. Schwartz, Sprint Senior Vice President of Corporate and Business Development. Make sure to subscribe to our daily newsletter! 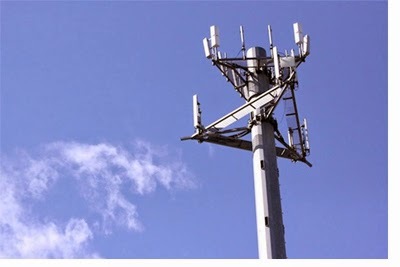 The analysts at Pacific Crest Securities prefer the wireless tower companies to the mobile carrier any day of the week. 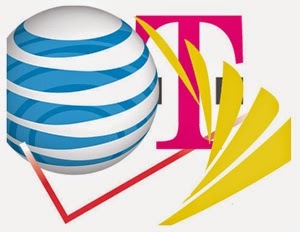 According to Michael Bowen and Trevor Upton, “While the carriers, Verizon Communications, AT&T, Sprint and T-Mobile US, have stabilized a bit, we remain cautious on the group and prefer the wireless towers, SBA Communications, Crown Castle International and American Tower.T-Mobile’s promotion of 4G tablets for the price of Wi-Fi tablets ended in May, but its discounted data plans for tablets remain. In all cases, two-year data plans were required to take advantage of the free or discounted tablets. We expect these free or heavily discounted tablets to boost tablet net additions, which should bolster overall net additions. We believe this will make it difficult to see the underlying net addition trends.” While the mobile carriers are seeing muted-revenue and average-revenue-per-user impact, the wireless tower companies seem much more reliable to researchers. 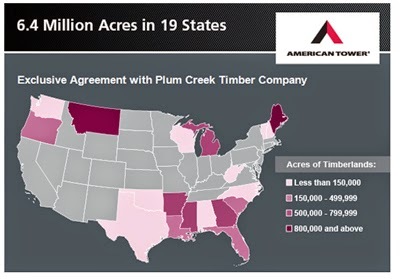 American Tower has recently entered into an agreement with Plum Creek Timber Company giving the company exclusive development rights to construct new towers on their property. This agreement provides the company with 6.4 million acres of land located in 19 states and access to that land with negotiated terms enabling expedited construction of new towers and reduced project cycle time.American Tower also has an agreement with Railroad Rights-of-Way, which provides 52,000+ miles of rights-of-way located in 40 states. Much of this property is located in urban or densely populated areas. Recently, on our LinkedIn Blog an industry professional posed the question: why are crews still required to do work at night? Crew leader at PDQ’s point was that it would be much safer for work to be done during the day. With the increase in tower accidents over the past few years, it’s a valid question to ask. Shouldn’t we eliminate unsafe work practices? This week in Clinton, Oklahoma KCCU posted a notice on their website explaining to listeners that an antenna needs to be removed from the tower, repaired, and then replaced. This would cause outages from the 9th-11th. While this may not be ideal for mobile carriers, it’s an option. It won’t be the end of the world if cell service is a little slow that day if the alternative is to put workers at risk. Working at night is a common practice though, according to David Trout, owner at TroutINV. As professionals in this industry it is up to us to ensure we use crews that are qualified to work at night under head lamps,” Trout explains. He suggests that working at night isn’t for a newcomer. Michelle Resch, owner at Infinite Wireless Solutions, said, “I think it continues to speak to the carriers priorities. They are so far and safely removed from what happens in the field. We should have skilled workers doing the appropriate jobs. But when schedules are aggressively driven by the carriers, job prices continue to decline, it only seems to make logical sense that the injury counts are going to continue to climb.” Let us know what you think by logging onto our LinkedIn Group and sharing your opinion. Should tower climbers work at night or is it an unsafe practice? Subscribe to our daily newsletter to read more stories like this! U.S. carriers shell out about $109 in capital expenditures per citizen annually, according to a new report from Recon Analytics. In 2013, US wireless capital expenditure spending hit an all-time high. AT&T and Verizon Wireless were going head-to-head to see who could finish their 4G LTE deployment first. According to Roger Entner of Recon Analytics, “AT&T’s attempt to overtake Verizon in network quality had the company spending roughly $11.5 billion on network improvements, while Verizon Wireless spent another $9.75 billion improving its network. Let me put this into context: AT&T and Verizon together spent more money improving their networks in 2013 than all 20 operators serving the five largest EU countries (EU5) combined.” That’s not counting Sprint and T-Mobile, who took the “slow and steady wins the race” approach during their 4G LTE build out. Once we add the capital expenditure of Sprint and T-Mobile, which both spent more on network improvements last year than they had in previous years, US operators spent more than twice as much as the EU5 operators did to improve their infrastructure covering roughly the same number of subscribers, Entner explained. “So, with US wireless carriers at the upper bounds of investing in infrastructure, is it reasonable to assume that they will spend even more money to deploy small channel networks that are slower and less efficient? Most investors will tell you that that is not a tenable outcome,” according to Entner. “So what does this mean? In the US, the carriers that have the largest swaths of contiguous spectrum will be able to provide fast download speeds. Only Sprint is continuously in this fortuitous situation and in some markets T-Mobile, due to pure happenstances, also has 20×20 MHz contiguous spectrum. The other carriers will have to rely on costly and still unproven “carrier aggregation technology” to achieve results similar to what is possible with wider, contiguous spectrum blocks,” he explains. 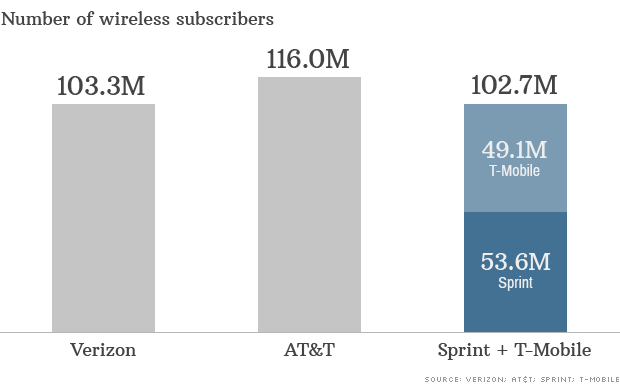 The future of the U.S. wireless industry may soon be in the hands of the Obama administration, CNN Money reported. Sprint and T-Mobile have been negotiating terms of a merger and with a price tag of $32 billion agreed upon, now all that’s left is for regulators to approve the deal. Despite SoftBank Chief, Masayoshi Son, shouting from the rooftops that this is a deal that must be made it’s tough to see how regulators will respond. When the FCC and the Department of Justice blocked a deal between AT&T and T-Mobile in 2011, they believed a combination of the two companies “would eliminate the important price, quality, product variety, and innovation competition that an independent T Mobile brings to the marketplace.” While T-Mobile has done a great job by increasing subscribers, cutting prices, and shaking up the industry, some believe that their success will be short lived. “They can’t continue this forever because it will cost them too much money, so the question is what’s next,” said industry analyst Jeff Kagan. According to CNN Money, some analysts see the carrier’s recent moves as an effort to boost its asking price in a potential acquisition. T-Mobile CEO John Legere said last month that consolidation in the industry was “a matter of when and not if,” and that his company could benefit from the additional scale and assets a merger would offer. Sign up for our FREE daily newsletter here! 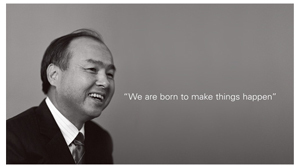 SoftBank’s leader, Masayoshi Son, is the Japanese billionaire who controls Sprint. You have probably heard a lot about him these past few months while a merger between Sprint and T-Mobile has been discussed. If there’s one thing Son has made clear, it’s that he expects this merger to go through and will be extremely unhappy if regulators hinder the acquisition. Last week, Sprint agreed to pay about $40 per share to buy T-Mobile US Inc, a person familiar with the matter said, marking further progress in the attempt to merge the third and fourth-biggest U.S. mobile network operators. The New York Times reported, “Mr. Son has been happy to wield his bully pulpit, calling repeatedly for consolidation within the wireless industry ever since his company, SoftBank, first moved to buy a majority stake in Sprint nearly two years ago. The American-educated Japanese mogul has always dreamed big. His company moved into the wireless telecommunications industry only eight years ago by buying Vodafone’s Japan assets, and quickly sought to become that country’s biggest cell phone service provider. ” The FCC and U.S. Department of Justice will need to sign off on the agreement, but executives at both companies are moving forward as if they don’t require that approval. It’s uncertain how the regulators will rule, and how this merger will affect the industry. One aspect that’s been speculated upon is: who will run the combined company? Some suggest that industry maverick and CEO of T-Mobile, John Legere, would take on the job. Sprint CEO Dan Hesse has said in response that he wouldn't mind not taking the post, citing his age of 60 and his plans to do other things. Although Legere has taken the industry by storm, we’ll have to see if he works well with Son.